Apprenticeship: Delivering Record Levels of Employee Retention Finding and retaining the right talent is tough. The National Restaurant Association Educational Foundation and American Hotel & Lodging Association recognize this fact and understand that maintaining a competitive workforce requires training models that work. Join NRAEF and AHLA in this session to learn about the innovative new apprenticeship program that is yielding 95% retention rates for restaurants & hotels nationwide. Finding and retaining the right talent is tough. SCRLA, the National Restaurant Association Educational Foundation, and the American Hotel & Lodging Association recognize this fact and understand that maintaining a competitive workforce requires training models that work. In an effort to help our members better address the tightening labor market, NRAEF and AHLA have launched two newly created apprenticeship programs for Restaurant & Lodging Managers. Supported by the US Department of Labor, apprenticeships are a powerful solution that equip workers with the skills needed to drive the success of your business. If you face challenges in attracting and retaining the skilled workers you need, the apprenticeship program can be your answer. What is apprenticeship? Apprenticeship is a training model that combines on-the-job learning with related classroom instruction to increase skill level and economic mobility. Apprenticeships are proven to reduce turnover costs, increase productivity, result in higher job satisfaction and create a more skilled and competitive workforce. The intent with the programs is to help grow the “bench strength” of each industry by cultivating and developing new supervisors into management positions. To learn more about this exciting initiative, we invite you to participate in an employer information session held on April 16th at 9:00 am at the Palmer Campus of Trident Technical College. 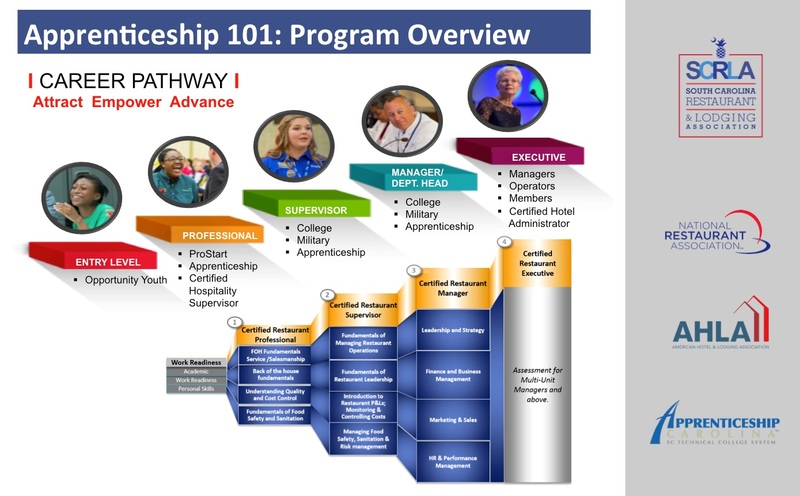 More information on the program can be found by visiting www.chooserestaurants.org/apprenticeship and www.ahla.com/apprenticeship.